Read this infographic for information on how cannabis use will affect your life in Canada as an international student in Canada. Read this notice for active scams targeting international students. Read this notice to find out more about how FIC students can access the clubs, events, and services offered by the Simon Fraser Student Society (SFSS). Please read the following notice for details on new emergency protocols and safety resources being introduced by SFU. These protocols will also apply to students studying at FIC, so please be sure you are aware of the changes outlined in the communication above. Please be reminded that smoking is prohibited in non-designated locations. 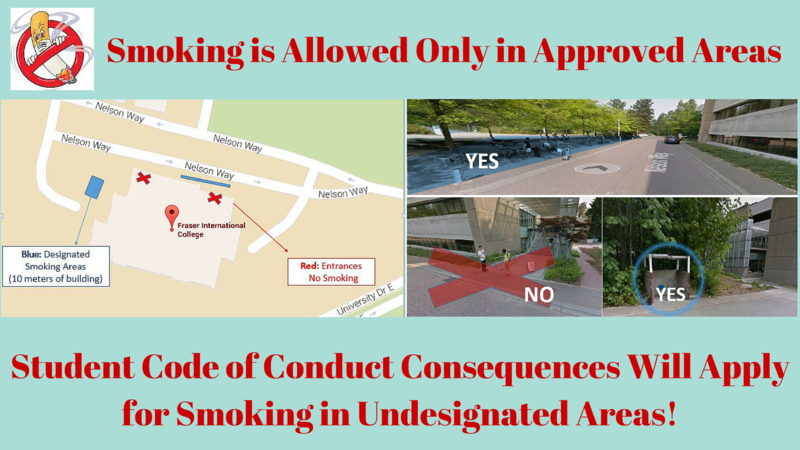 If you are caught smoking in non-designated smoking areas, you will be penalized. The designated smoking areas are shown on this map. Thank you for your cooperation. SFU has introduced a “Zero Waste Initiative” within the last eighteen months. This initiative aims to reduce waste on campus as well as to promote ways to appropriately discard waste on campus in a way that is sustainable for not only the campus but also the environment. To find out more more about SFU’s Zero Waste Initiative and how you can get involved, please click the link above.